3D printed guns are difficult gray area of 3D printing. If you are pro gun, you may have 3D printed your own AR-15 lower and a couple Liberator pistols from Defense Distributed. If you’re anti-gun, you work for the government and try to pass laws to infringe on the rights of 3D printers everywhere. The 3D printed gun debate will continue to divide the 3D printing community. As desktop printers continue to go down in price and the public sees printers become more mainstream, more people will be tempted to 3D print their own firearm. Dagoma, a French 3D printer manufacture, has jumped into the 3D gun debate with a public disinformation campaign. While on the surface they have just trolled the 3D printing community with false files, the implication for what they have done go far deeper. To enter into this debate Dagoma 3D printers has partnered with TBWA, a advertising agency. Together they have launched Operation Harmless Gun (OHG). This campaign has release a slue of false files for 3D printed guns. In this operation Dagoma and TBWA downloaded original gun files, and then modified them to try to render them into non-functioning gun files. In these modified files, they have altered the files in ways that are not immediately visible to inexperienced 3D printers. They then created fake profiles and released the altered files onto forums. They claim the altered files have been downloaded over 13,000 times. (In comparison, DEFCAD has reported that the original Liberator gun files have been downloaded millions of times). This is not the first time that anti-gun activist have trolled 3d gun files. In 2015 the 3D Addivist Cookbook was released online. In it, artist modified Liberator files into teapots and other household items. Dagoma and TBWA are unique (or foolish) in that they have false files and their trolling intent. While on the surface Operation Harmless Gun is a coordinated trolling operation, there are deeper issues that this exposes in the 3D printing world. The first issue this brings to mind is that OHG is a violation of the copyright and trademark of the original gun designers. OHG is intentionally and maliciously altering functioning gun designs to render them inoperable. This violates the intent of the original gun designers, and also can cause harm to the designers reputation and brand. If a particular gun file is associated with a brand of designer, then unauthorized changes can impact the quality and reputation (and any applicable TM) of the original gun designer. Given the open source nature of 3D printing and gun files from FOSSCAD, this legal argument may be something that will take time to argue in court. The original file designers will have to get together and decide if facing OHG in France or the USA is a viable option. Given that 3D printing and copyright is a legal gray quagmire currently, legal recourse to address OHG may be limited. 3D-PT has attempted to contact Dagoma for their input on OHG, but has received no response. In the video they show how they changed a gun barrel by shrinking the bore diameter down so it would not chamber a bullet; in another part they alter the length of a rifle receiver to keep it from properly closing the bolt. Other mods made to the hammer prevent it from striking the firing pin. If these modifications had been made to a commercially produced firearm, that gun company would face recalls and decades of liability lawsuits. These changes to the original guns may be intended to render a printed gun inert, but I wonder if OHG actually had a gunsmith verify that their mods were safe. From what I can tell, OHG just let CAD drafters hack away at the files without any prior gun design experience. 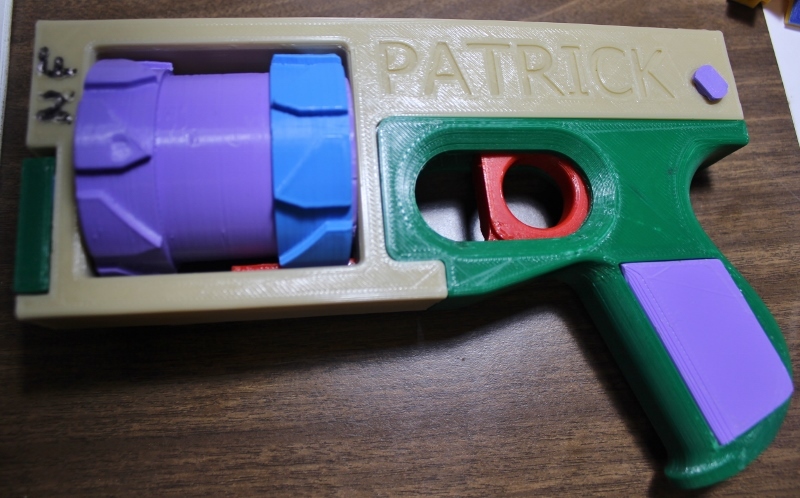 With 13,000 modified files downloaded, that means there is a chance that someone will try to print a altered gun, and with enough printed pieces will attempt to fire the altered gun. The best result is that the gun does not fire, the worst is that the altered gun misfires and causes harm. By releasing intentionally altered files, OHG has intentionally released a faulty digital product that can cause real physical harm. OHG has intentionally released faulty false files that can be potentially harmful without regard for who will download and 3D print them. This is reckless towards the 3D printing community. Legally this can present a liability issue for Dagoma and future designers. Today if a company sells a product that they know is unsafe, that company will face consumer protection laws and be liable for any injuries or damages. In the future if a company release a faulty file and its printed at home, the designer may be found as liable as any shoddy factory. 3D printers are a resourceful lot when you think about what 3D printing entails. We take a pure idea and shape it into a physical object. Then reality kicks in and printers have to clean up our prints with files, drills, hobby knives, etc… I’ve tried to 3D print a gun in the past, and even from the original files I spent about a week hand tooling and fitting the parts together to get a rough working prop gun. The video from Dagoma shows that the parts they printed did not fit, either by adding extra material or removing it from critical attachment points. For a 3D printer that wants to make a gun, these modification can be corrected with some basic tools. If the barrel has been choked down, there is nothing to keep the 3D printer from using a drill to ream out the barrel to the correct chamber diameter. 3D printers have all experienced bad 3d prints from poor digital files. For someone to go through the time and expense of 3D printing a gun from these modified files, it is not a stretch for the 3D printer to spend some more quality time physically correcting the final 3D print. OHG files are an inconvenience for 3D printers, but not a deterrent against handy printers from printing their own firearms. The most troubling part of OHG is not the anti-gun trolling, but the active and coordinated campaign to intentionally disseminate these false digital files. While the original gun files can be easily found, the internet waters are muddied a bit by these altered files. Dagoma and TBWA have spent considerable time, money and manpower as a private company’s to download and modify the files. On top of that they then spent material and effort to 3D print the modified files for physical testing. If a private company goes through this amount of effort to release 400+ bogus files, what is to stop others from going through the same efforts to attack other 3D printing files? This disinformation campaign is scary for 3D printers. As more major companies expand upon additive manufacturing, the possibility for corporate espionage and public disinformation increases. As new people start 3D printing, they will be more likely to downloading and 3D print junk files, which can discourage them from 3D printing further. A disinformation campaign can also spread negative publicity for 3D printing. If a company can attack the digital files that are essential to 3D printing, public perception of 3D printing can change. If we look at how Russia interfered in the 2016 presidential election, we have seen that a state actor can easily spread disinformation to a public that does not pay attention to sources. In the same way in the future private and state actors can use 3D printers to spread misinformation. I can see a anti-gun campaign in the future where large coordinated groups or state actors flood the internet with false files. With only 13,000 downloads, the Dagoma campaign is a drop in the ocean of available working gun files. But what Dagoma has done is write the playbook for future disinformation campaigns against the 3D printing community. Dagoma is a French 3D printer manufacturer (Closed source), and they have also released a software control that has more dangerous implications for the 3D printing community. Dagoma has announced that they will incorporate file detection software in their printers to detect 3D gun files. This detection software will inspect your files in the printer against a library of known gun files, then block the files from being printed on their printers. HP has also threatened to use similar software and legal contracts with its customers to deter people from 3D printing guns on their hardware. There are a slue of technical questions that the software would have to address before this becomes effective. The printer may bypass these current controls by changing the file name, orientation, or settings of the gun file. The printer would also have to carry the memory necessary to hold and scan through the library. The file detection software may also block files that are similar to gun files. Our technology should not censor us. This idea that a 3D printer company can censor what we 3D print tramples upon our 1st amendment rights to free speech. The idea that a private company in another country can dictate what I can / can’t print with their 3D printer is abhorrent. Current paper printers have no such restrictions for banning the consumer from printing pictures of guns or other objectionable content. If we hold 3D printers to the same legal standards as 2D printers, then we must have a long conversation about the control technology has against us. As a consumer, if I buy a 3D printer I should have the right to print whatever toy, household good or occasional gun I want. What holds true for a paper printer should hold true for plastic. From a point of free speech, our technology should not censor us. Nor should our 3D printers have the capability to spy on us with file detection firmware installed into the printer. 3D printers should also be wary of this. The whole point of owning a 3D printer is to produce whatever physical object you want. If Dagoma want you to sign a release, that is one thing. However, actively installing spyware on their 3d printers is a massive invasion of 3D printers privacy. Boycott Dagoma and the clients of TBWA. Be diligent in sourcing your files for 3D printed guns from the original sources. Inspect the meta data of the file to see when and who uploaded the files. Purchase from open source printer companies that respect your privacy. Identify and flag modified files for removal when you come across them. Flag false accounts and profiles that spread disinformation. Support new 3D printers by showing them valid files and supports.